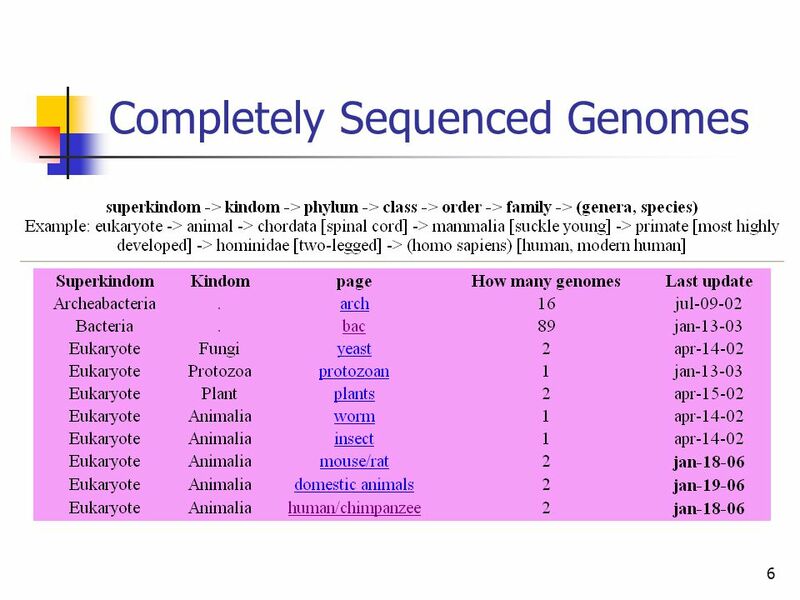 2 2 Gene Finding Genomes of many organisms have been sequenced. 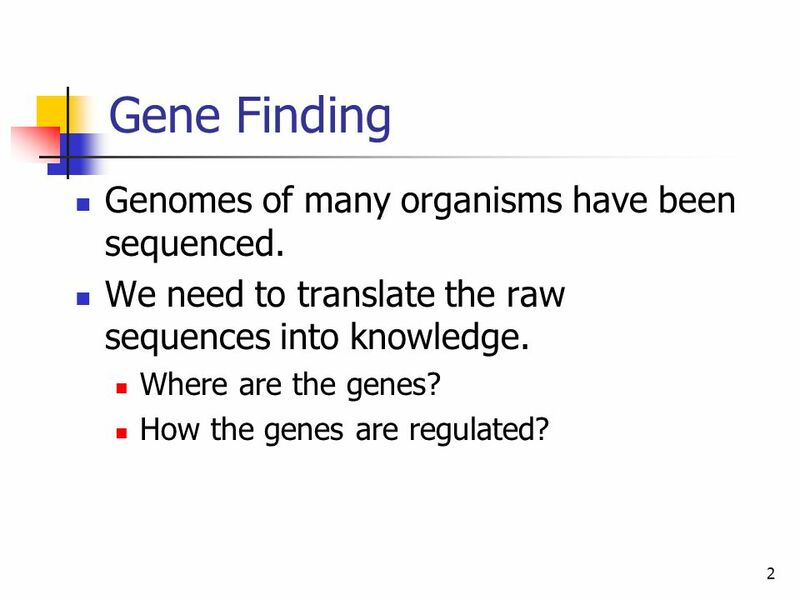 We need to translate the raw sequences into knowledge. Where are the genes? 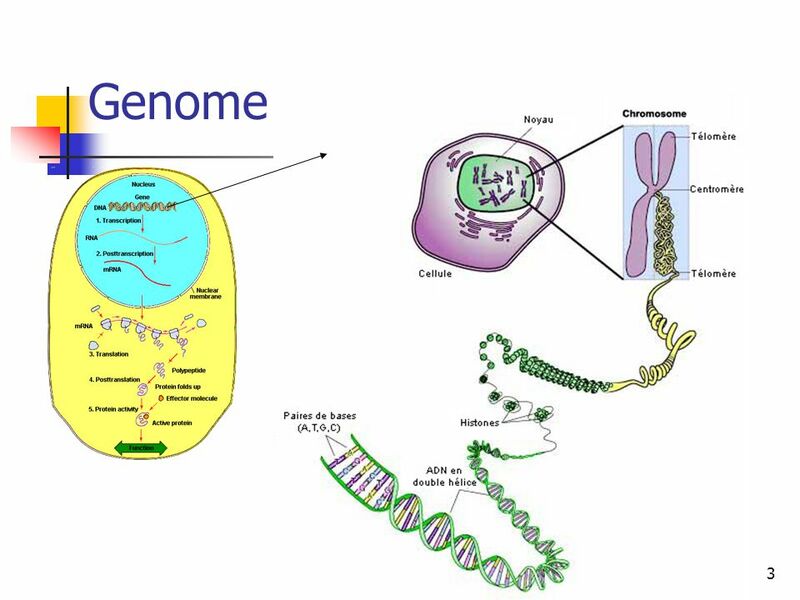 How the genes are regulated? 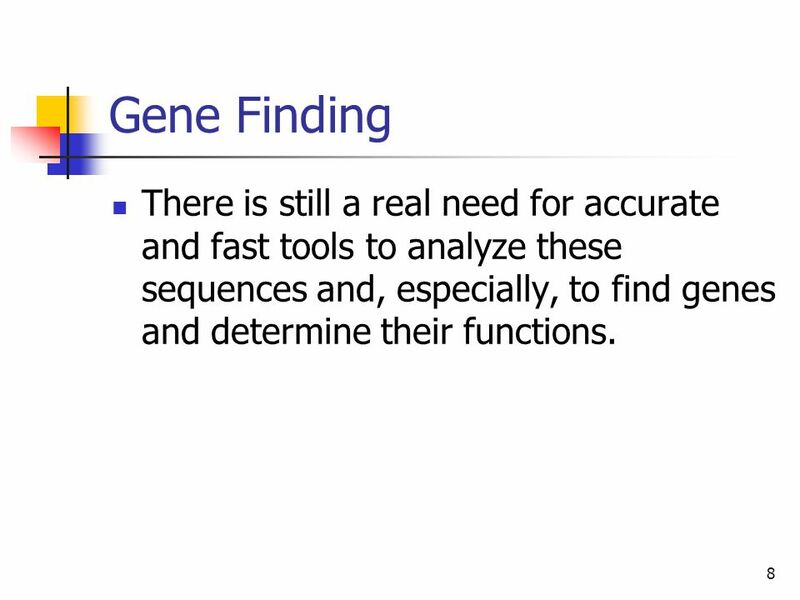 8 8 Gene Finding There is still a real need for accurate and fast tools to analyze these sequences and, especially, to find genes and determine their functions. 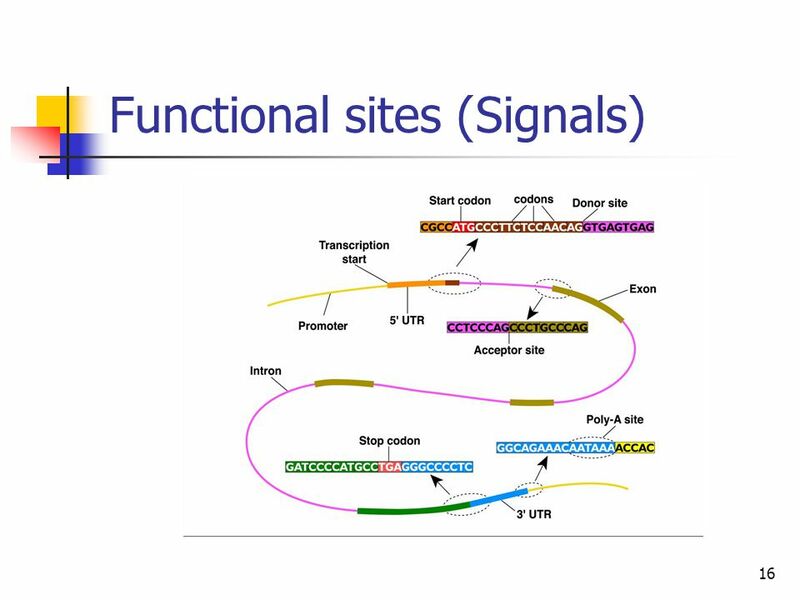 12 12 Genes Functionally, a eukaryotic gene can be defined as being composed of a transcribed region (coding region) and of regions (regulatory region) that cis-regulate the gene expression, such as the promoter region which controls both the site and the extent of transcription. 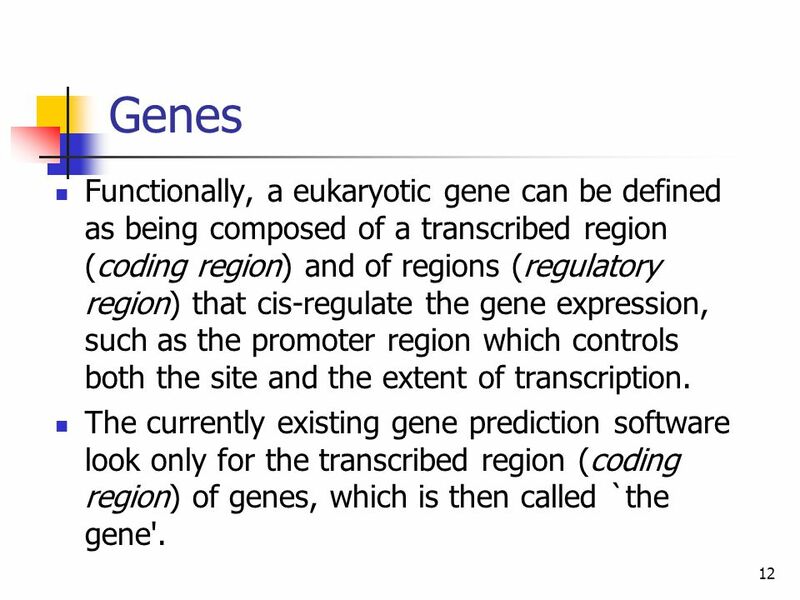 The currently existing gene prediction software look only for the transcribed region (coding region) of genes, which is then called `the gene'. 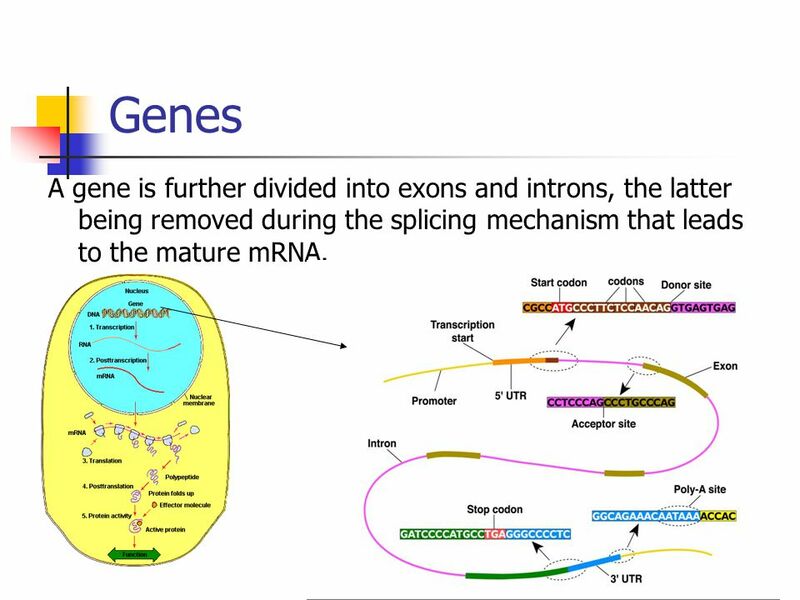 13 13 Genes A gene is further divided into exons and introns, the latter being removed during the splicing mechanism that leads to the mature mRNA. 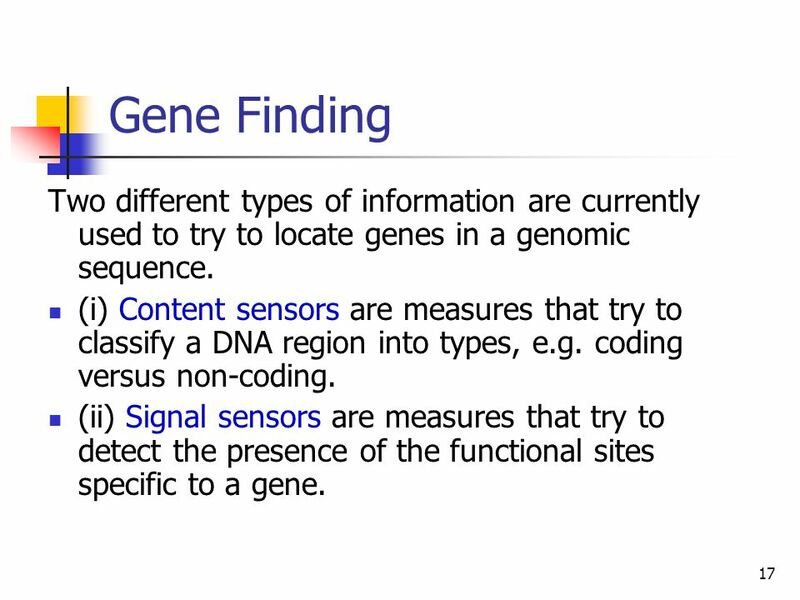 17 17 Gene Finding Two different types of information are currently used to try to locate genes in a genomic sequence. 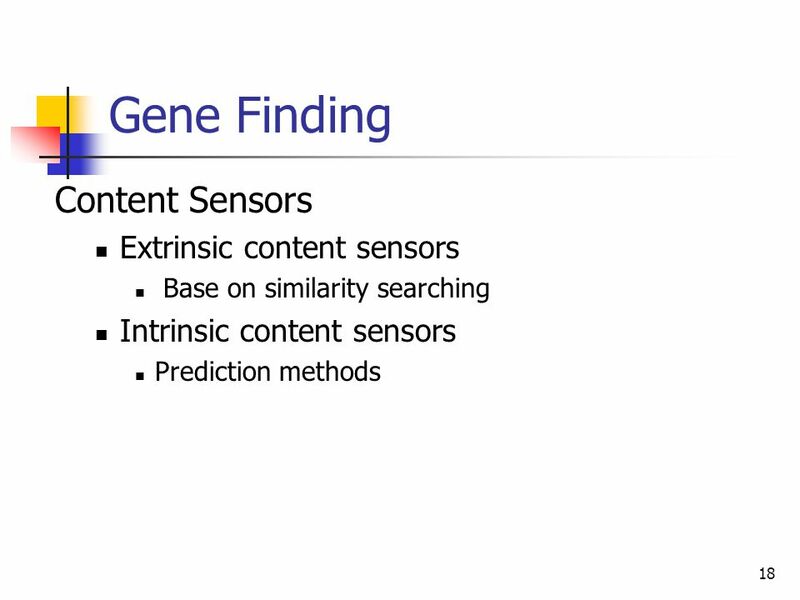 (i) Content sensors are measures that try to classify a DNA region into types, e.g. coding versus non-coding. 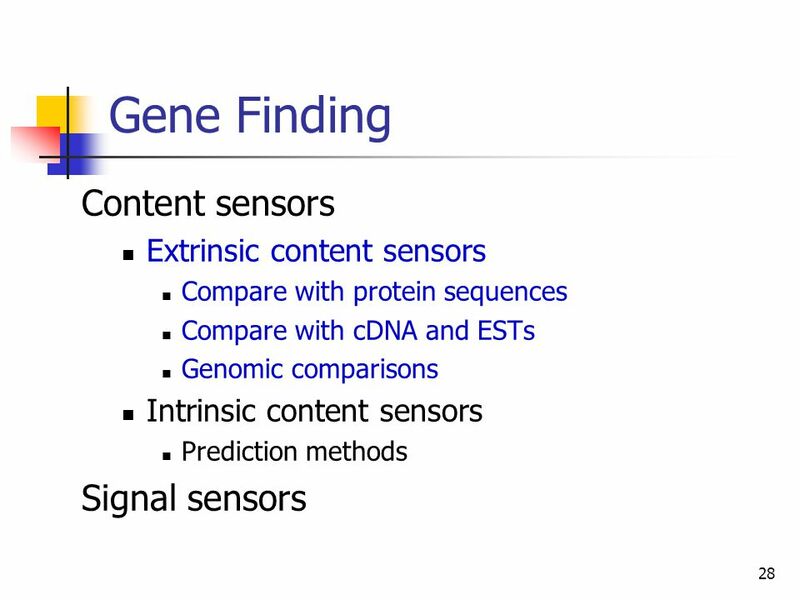 (ii) Signal sensors are measures that try to detect the presence of the functional sites specific to a gene. 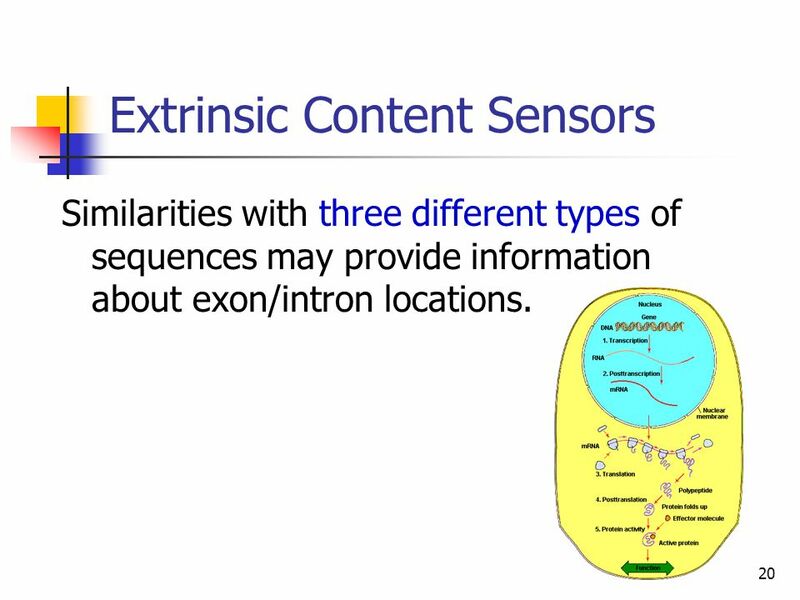 20 20 Extrinsic Content Sensors Similarities with three different types of sequences may provide information about exon/intron locations. 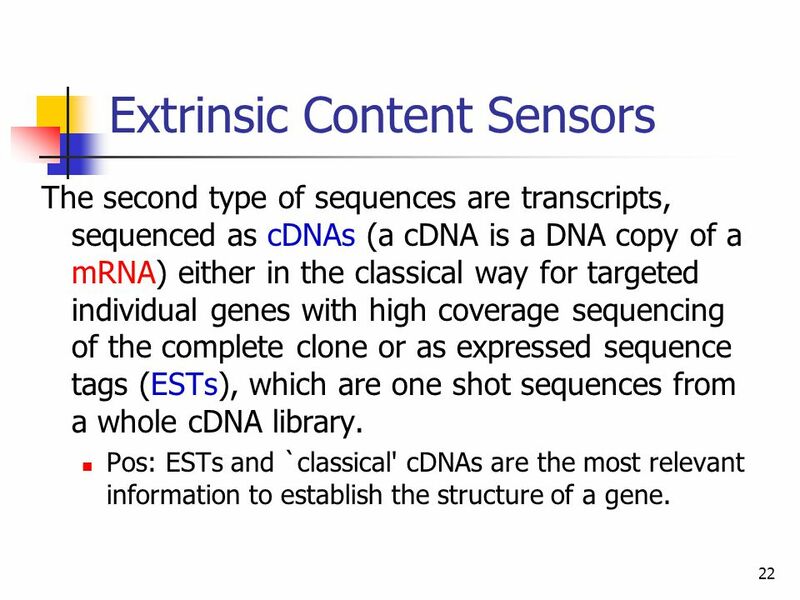 22 22 Extrinsic Content Sensors The second type of sequences are transcripts, sequenced as cDNAs (a cDNA is a DNA copy of a mRNA) either in the classical way for targeted individual genes with high coverage sequencing of the complete clone or as expressed sequence tags (ESTs), which are one shot sequences from a whole cDNA library. 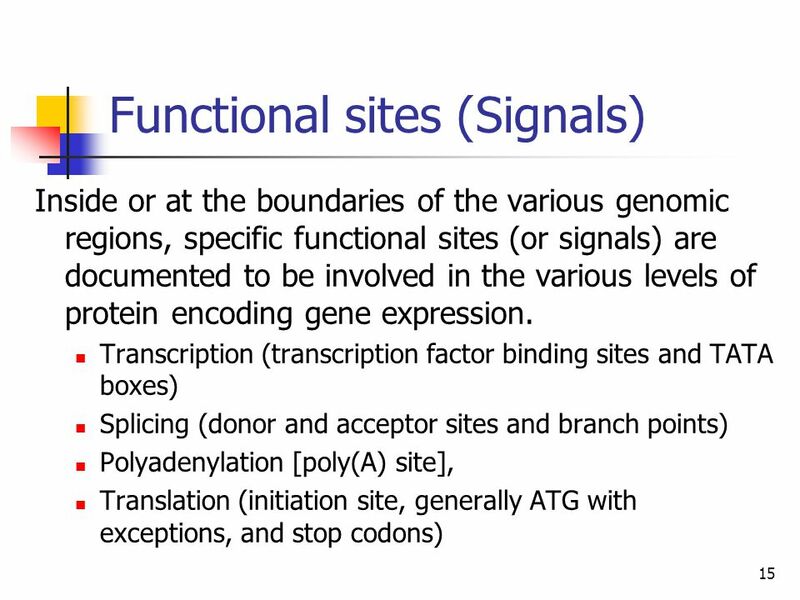 Pos: ESTs and `classical' cDNAs are the most relevant information to establish the structure of a gene. 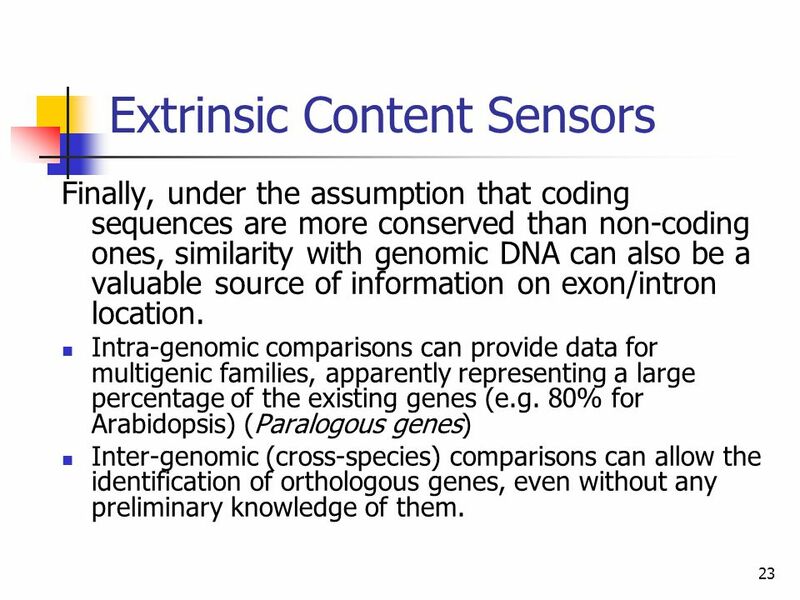 23 23 Extrinsic Content Sensors Finally, under the assumption that coding sequences are more conserved than non-coding ones, similarity with genomic DNA can also be a valuable source of information on exon/intron location. 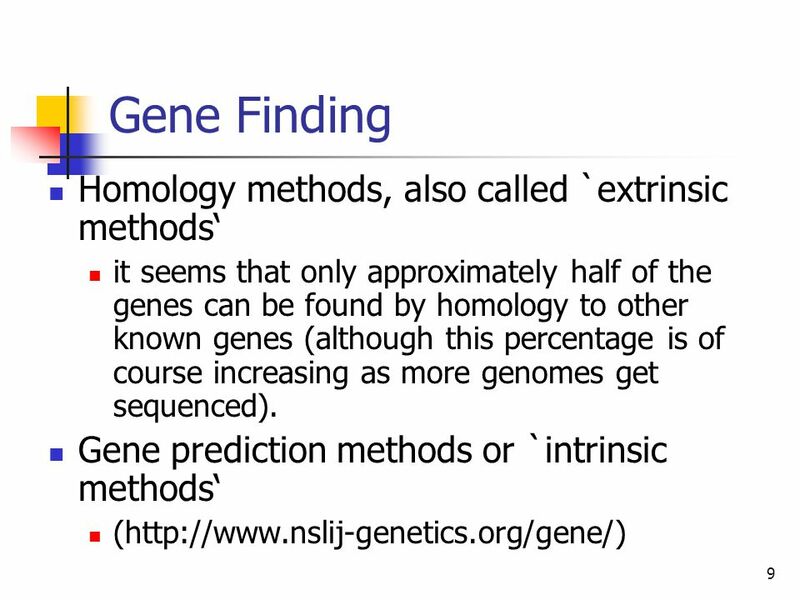 Intra-genomic comparisons can provide data for multigenic families, apparently representing a large percentage of the existing genes (e.g. 80% for Arabidopsis) (Paralogous genes) Inter-genomic (cross-species) comparisons can allow the identification of orthologous genes, even without any preliminary knowledge of them. 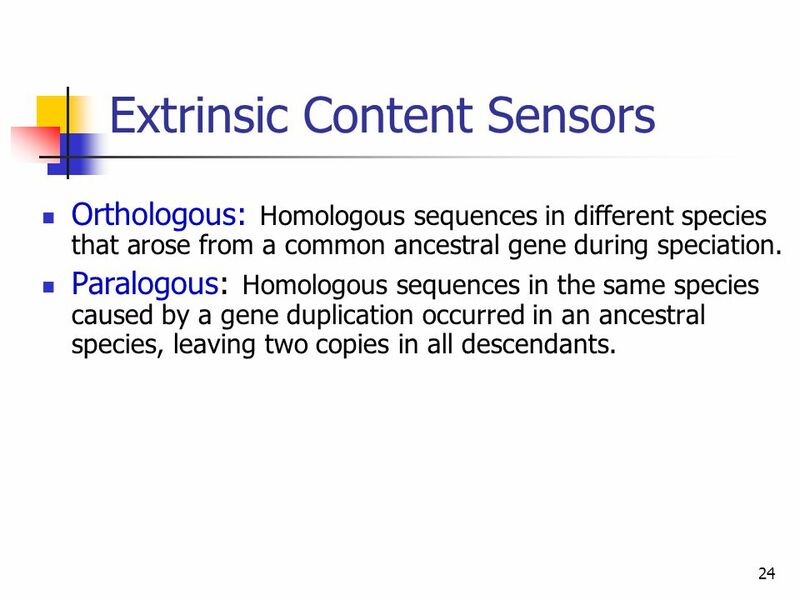 24 24 Extrinsic Content Sensors Orthologous: Homologous sequences in different species that arose from a common ancestral gene during speciation. Paralogous: Homologous sequences in the same species caused by a gene duplication occurred in an ancestral species, leaving two copies in all descendants. 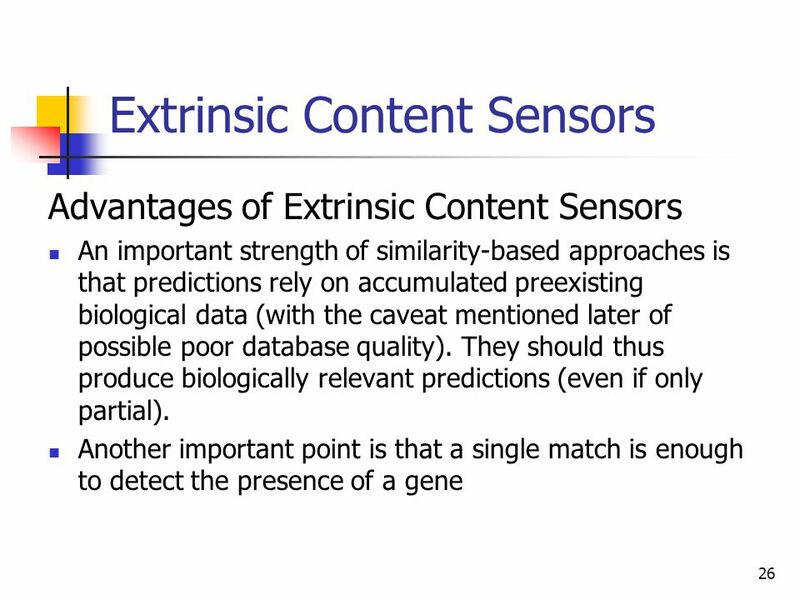 25 25 Extrinsic Content Sensors Disadvantages of genomic comparisons Distantly related: The similarity may not cover entire coding exons but be limited to the most conserved part of them. 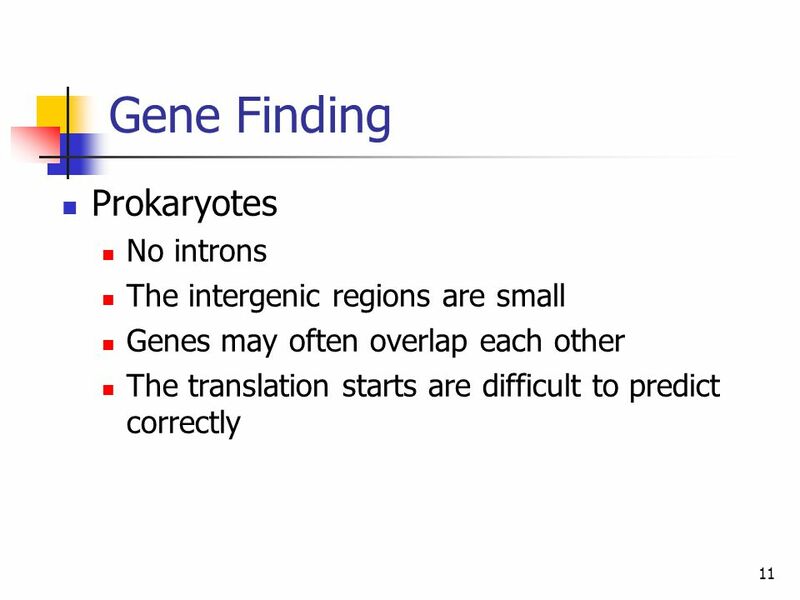 Closely related: It may sometimes extend to introns and/or to the UTRs and promoter elements. 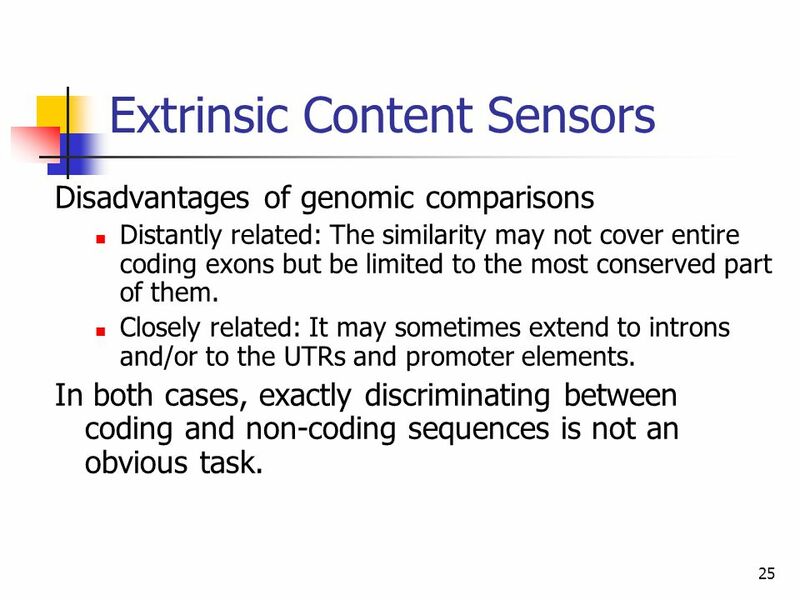 In both cases, exactly discriminating between coding and non-coding sequences is not an obvious task. 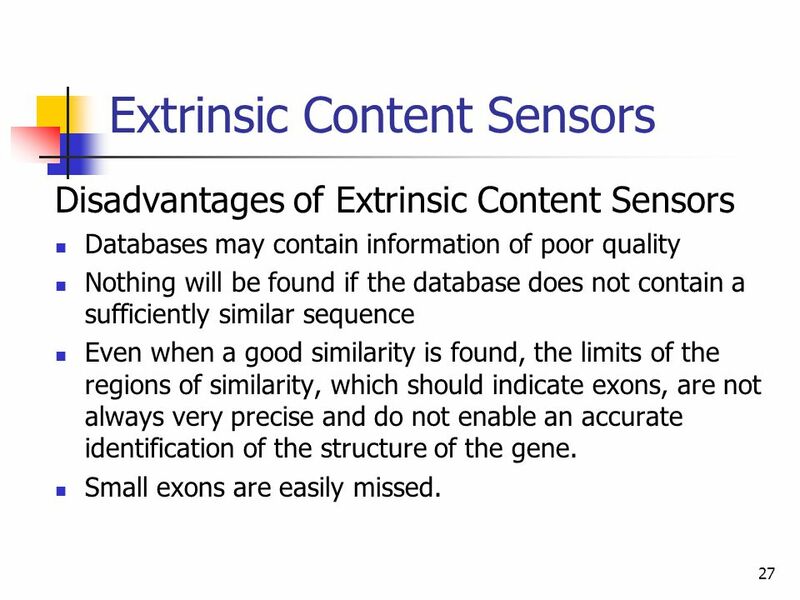 27 27 Extrinsic Content Sensors Disadvantages of Extrinsic Content Sensors Databases may contain information of poor quality Nothing will be found if the database does not contain a sufficiently similar sequence Even when a good similarity is found, the limits of the regions of similarity, which should indicate exons, are not always very precise and do not enable an accurate identification of the structure of the gene. 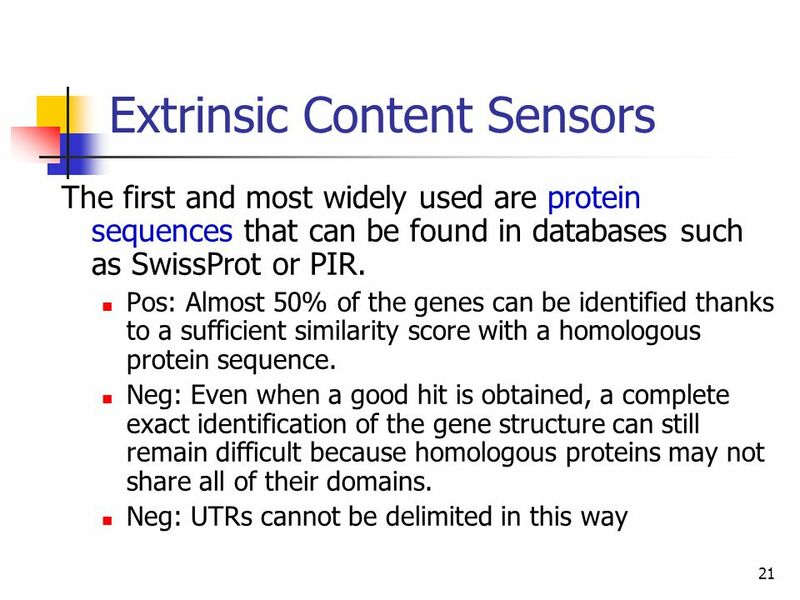 Small exons are easily missed. 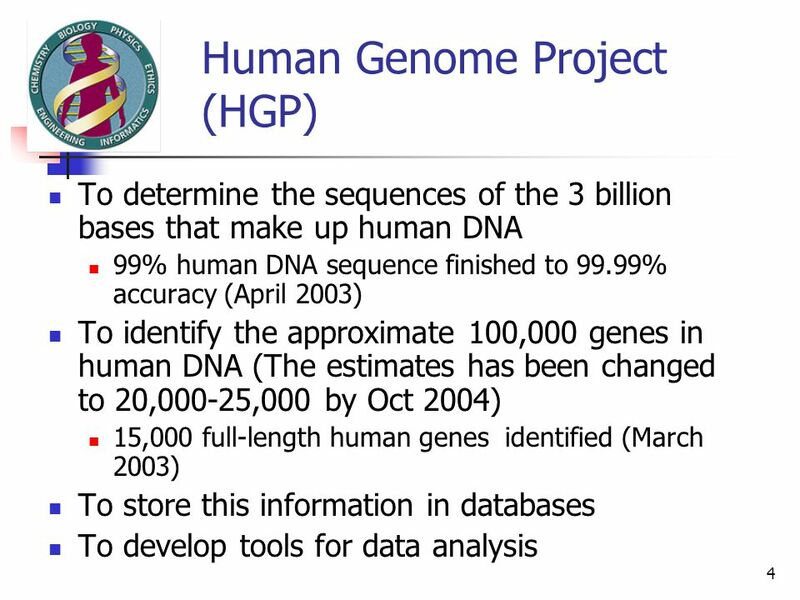 Download ppt "1 Gene Finding Charles Yan. 2 Gene Finding Genomes of many organisms have been sequenced. We need to translate the raw sequences into knowledge. Where." 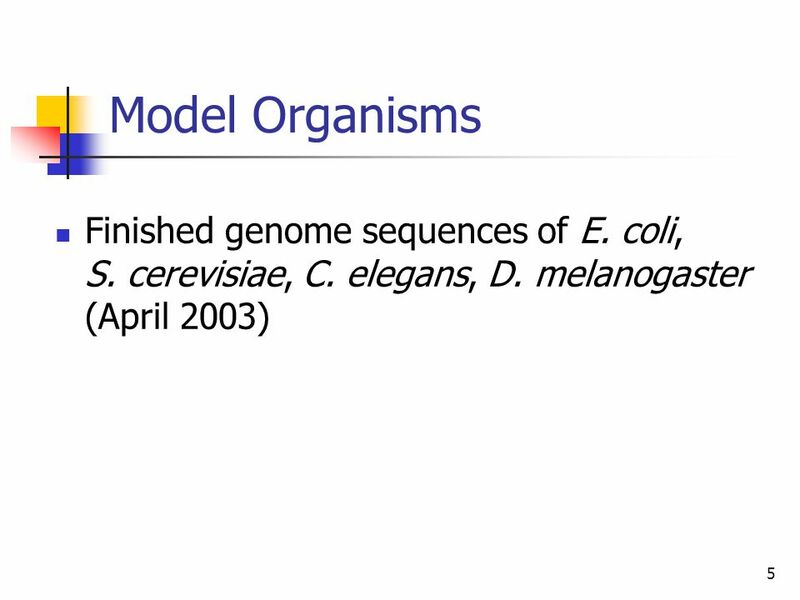 Basics of Comparative Genomics Dr G. P. S. Raghava. 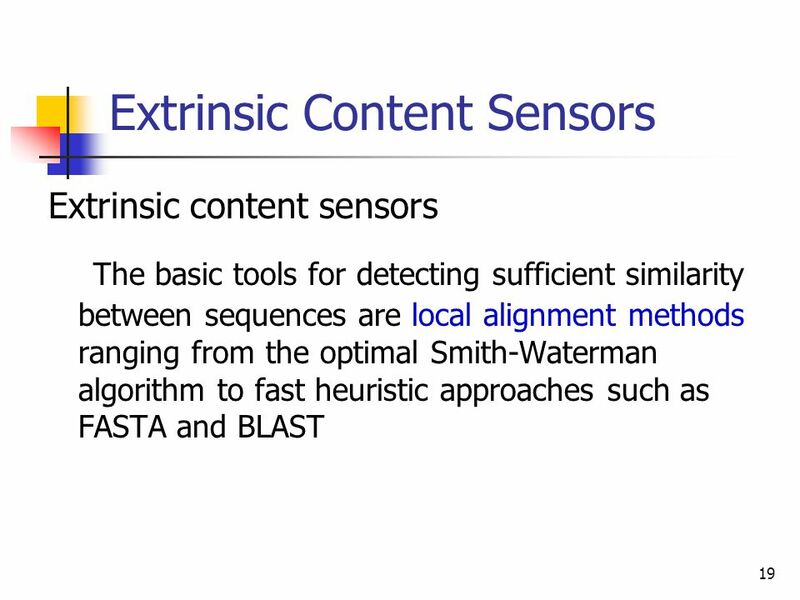 Psi-BLAST, Prosite, UCSC Genome Browser Lecture 3. 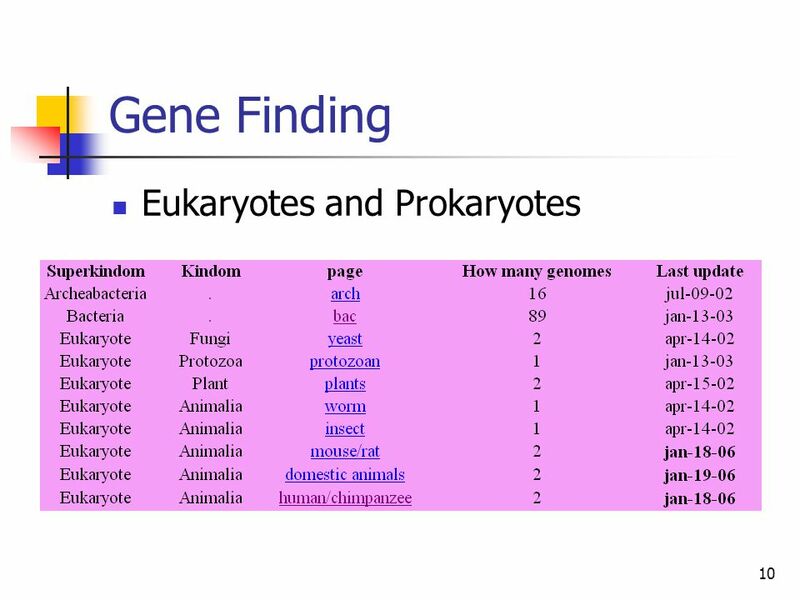 Finding Eukaryotic Open reading frames. 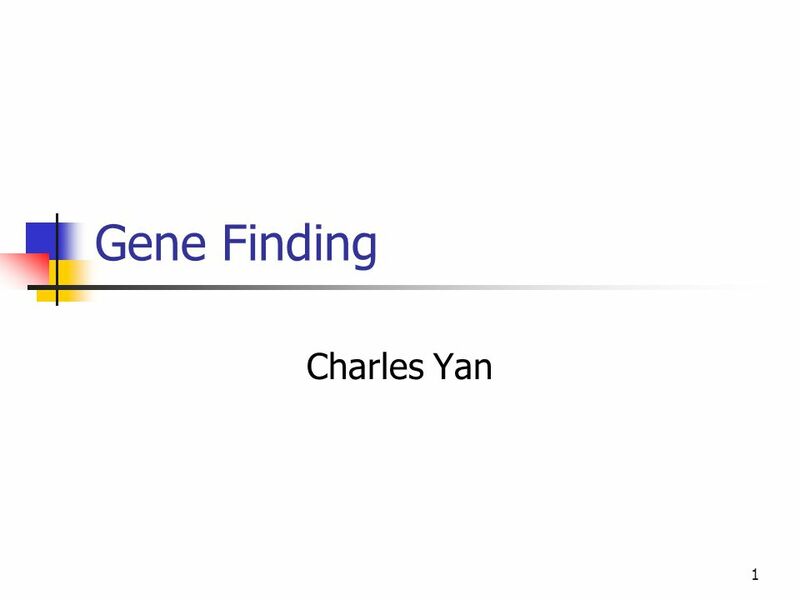 6/10/2015Changhui (Charles) Yan1 Gene Finding Changhui (Charles) Yan. Online Counseling Resource YCMOU ELearning Drive… School of Architecture, Science and Technology Yashwantrao C havan Maharashtra Open University, Nashik. 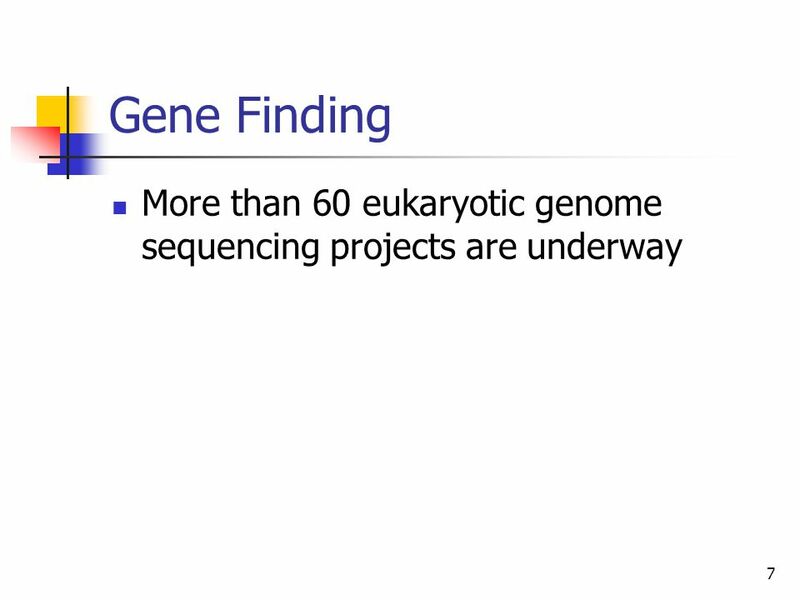 1 Gene Finding. 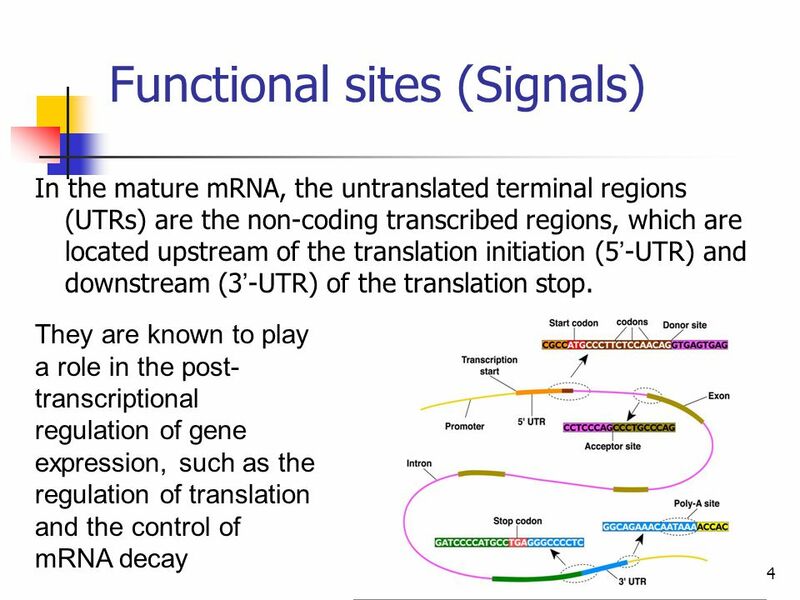 2 “The Central Dogma” TranscriptionTranslation RNA Protein.